It’s enormous. It’s rude. It’s The Misfit Christmas Stocking. 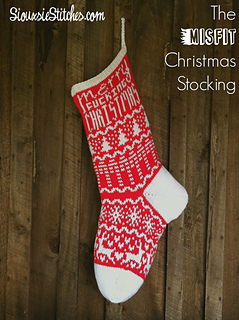 Designed to be HUGE for maximum gift capacity and misfit-ness, this stocking--if knitted as instructed--measures 10” wide and 21” from cuff to bottom of heel and 19” from heel to toe. However, if you would like a stocking of a more reasonable size, just use smaller needles and a corresponding weight of yarn. 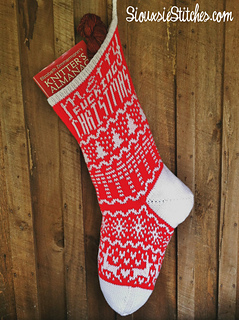 The Misfit Christmas Stocking is knitted in-the-round from the cuff down with a short row heel and grafted toe. I strongly recommend acrylic yarn for this project because it’s durable and moth-proof (remember, your stocking will spend 11 months per year in storage!) and less expensive so you can knit one for all the misfits you love!